Even though it’s been unseasonably cool lately here in San Luis Obispo county, it’s hard to not be thinking about irrigation as we move into that time of year when we are pretty much guaranteed not to get any real rain for the next six months or so. That combined with the drought that we are experiencing means that we need to be as careful as ever to adjust and maintain our irrigation systems. Just like other aspects of your landscape, irrigation systems require regular maintenance. Valves can start leaking, emitters get clogged, lines get damaged, and watering schedules need to be adjusted. Regular maintenance of irrigation systems can greatly increase the lifespan of the system, increase plant health, and reduce excess water usage. • Check for leaky valves that need repair. With the valves off, walk through your landscape following the irrigation lines and looking at any sprinkler heads. Notice if there is any water seeping through even while the valve is off. If there is, you may need to repair or replace the valve associated with that part of the system. • Check for clogged emitters. Drip emitters are great at delivering a specific amount of water directly to the desired plant while greatly reducing wasted water. They do, however, get clogged from time to time, especially if the system does not have a filter installed. Turn on your irrigation and walk through your landscape checking the emitters at each plant. If you see an emitter that isn’t dripping, simply remove it and replace it with a new emitter. Emitters are labeled according to the amount of water they deliver per hour(GPH or LPH) so make sure you replace the clogged one with a similarly rated emitter. • Inspect the irrigation lines for leaks. 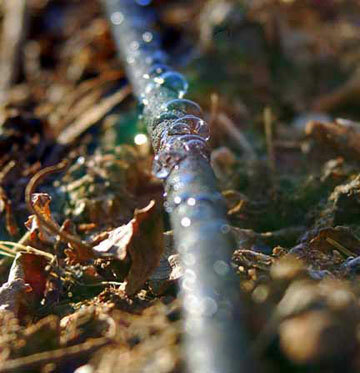 Above ground irrigation lines are usually made from black or brown Polyethylene tubing. This tubing is fairly strong and reliable, but it can develop leaks from getting snagged in lawn mowers, chewed on by animals, or getting caught under a shovel or hoe. If you see any leaks, you will need to cut out the section of tubing where the leak is, and use a coupler to splice the tubing back together. • Adjust the watering schedule. As plants mature and seasons change, their water needs can change. A plant that has just been put in the ground will typically need more water to get established. Once the plant is established, it’s water needs will decrease. Often times a watering schedule is set immediately after planting, but it is never readjusted as the plants mature. This can negatively affect the health of the plants and is an unnecessary use of water in the landscape. Likewise, as the seasons change, the watering schedule will need to be adjusted according to the weather. Consider installing a rain shutoff switch, which automatically senses rainy weather and shuts off the system. Even if it’s not raining in the winter, plants will typically need to be watered less since it’s cooler out and the days are shorter, which leads to less evaporation. Watering schedules can be adjusted at the irrigation controller or timer. Examine the needs of the plants that you are watering and adjust the schedule accordingly. 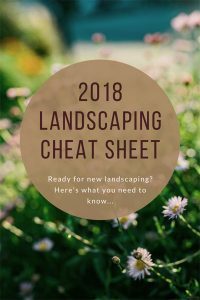 Irrigation system maintenance is an often overlooked part of keeping your landscape healthy, but it’s fairly simple and easy to do. If you can dedicate some time to it every month, you will use less water and your plants will thank you. If you have any questions or need some more tips, give us a call and we’d be glad to help.